The Buchanan tennis team captured the 2015 Valley team tennis championship with a 6-3 victory over Stockdale of Bakersfield. It was the Bears second consecutive Valley title and their third in the past four years. 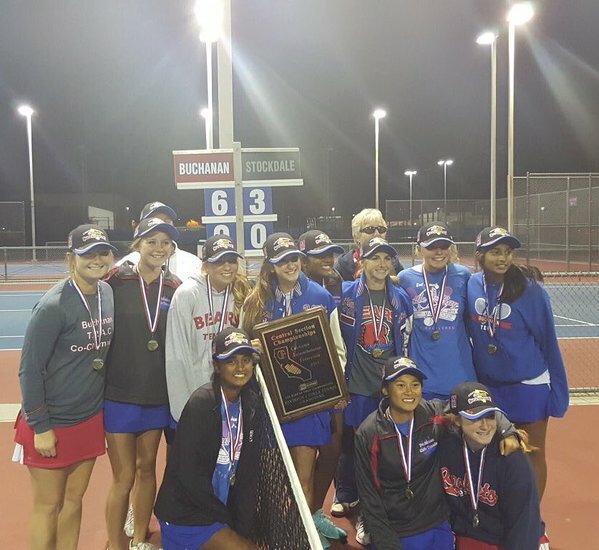 Another Valley title for the Buchanan tennis team can mean only one thing: A trip to the Doghouse Grill, a tradition the girls enjoy almost as much as the championship – almost. After beating Stockdale 6-3, with little threat, the Buchanan Bears made the hop, skip, and a jump from their home court to the popular eatery, celebrating their second consecutive Central Section D-1 championship, and third in four seasons. And what sets this team apart, according to head coach Jonathan Slater is the team’s tireless work ethic, especially seniors Sravya Gudipudi, Lauren Lee, and Sienna Swain. Buchanan senior Sienna Swain returns a ball in Buchanan’s team victory over Stockdale on November 12. 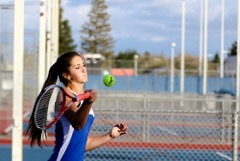 Swain won her match 6-1, 7-5 which clinched the D-1 Central Section Valley tennis title. And this trio knows nothing but winning. Consider the facts: Over their four years they have gone 39-1 in the TRAC, 76-3 in the Central Section and 88-12 overall including four TRAC titles, made four straight Valley Finals, won three Valley Championships. A few days before their Tuesday championship, the doubles team of Lasya Guidipudi and Lee won the Valley doubles title, defeating Stockdale’s Emily Horrigan and Erica Paradise 6-2, 6-2. Guidipudi, a sophomore, and Lee have created a great chemistry that extends beyond the tennis courts. Couple the experience of winning the doubles title with winning a team Valley title and it’s been a senior year to remember for Lee. The Bears hosted a home Southern California Regional match against Norwood on November 17. 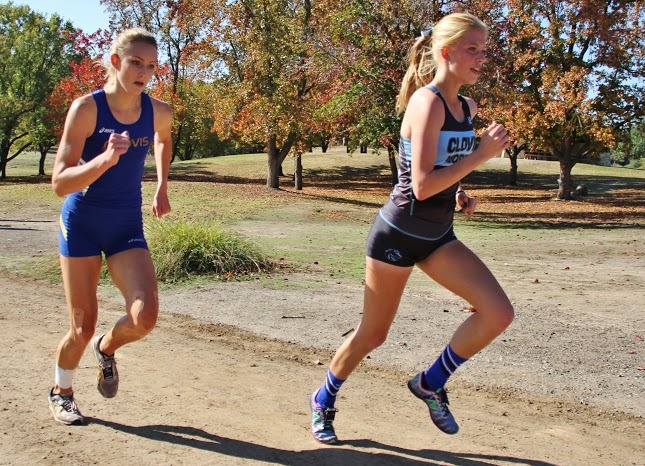 Clovis North’s Lauren Moffett, who later signed a National Letter of Intent with Vanderbilt, easily wins the TRAC individual title, including her closest competitor Mikayla Sodersten, who battle shin splints all race. Lauren Moffet, who later signed her National Letter of Intent to attend Vanderbilt, of Clovis North had an easy time winning the TRAC championship, cruising to a 22 second victory over Meagen Lower of Buchanan, but it was the Buchanan girls team that dominated the rest of the runners in winning the team title in the 3.1 mile race. Using great efforts from Lowe, Skylar Steenburgh, Katie Nili and Clare Hernandez, the Bears defended their 2014 title. But it was disappointment for Clovis standout Mikayla Sodersten, who battled an shin injury and placed seventh. Buchanan’s Tom Pritisk looks to the finish line and first place in the boys’ individual race at Woodward park for the TRAC championships The Buchanan boys and girls team both won the team titles. 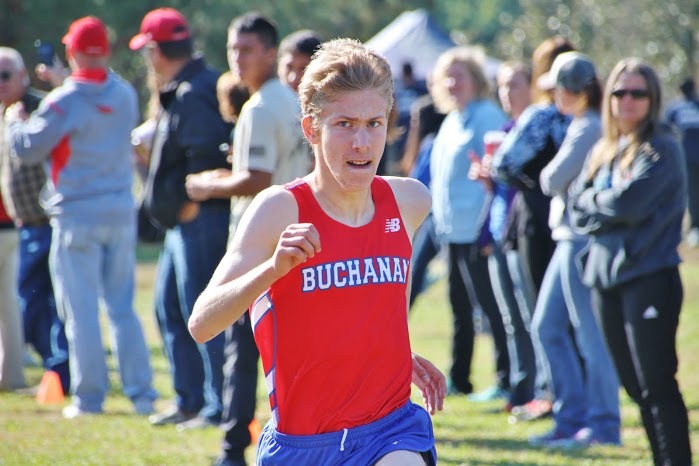 The boys title was won by senior Tom Pritsky of Buchanan but his teammates stepped it up too, with junior Stewart Fernandez and sophomore Hayden Hansen, finishing second and third respectively, propelling the Bears to an overall team victory. Clovis West’s Janie Ellis would not let this title slip way. Not after being upset in the TRAC finals by Clovis North’s Elizabeth Schulz. Ellis rallied down a set to beat No. 2 Sravya Gudipudi of Buchanan on November 6 to capture the D-1 Valley individual tennis title as Ellis won the last two sets 6-1, 6-1 after dropping the first 2-6. The Central football game peaked at the right time in the season, beating Clovis East in the final TRAC game 66-44 and upsetting Centennial 30-19 as Grizzly quarterback senior Nick Szpor threw for 213 yards and three touchdowns. Central came in as the No. 10 seed and Centennial, after a promising start to the season, was seeded 7. But don’t let the seed or overall record (4-7) fool you: they beat No. 1 Clovis (in the bizarre game known as Thirteengate), and played Bullard, Buchanan and Clovis North tough in tight losses. The reward for Central? Another trip to Bakersfield, this time to face No. 2 Liberty-Bakersfield. A week before, in one of the wildest games in the TRAC, Central scored an amazing 43 points in the second half against Clovis East, en route to a 64-44 win. The Central comeback denied Clovis East their first win in league play in four years. Quarterback Nick Szpor had the best game of his career, throwing for 252 yards, five touchdowns, and zero interceptions. All season the boys water polo final has pointed to the dream match up between Buchanan and Clovis, the girls featuring Clovis and Clovis West, teams that battled each other during the season. And the seeding committee made sure the collision course is on target. 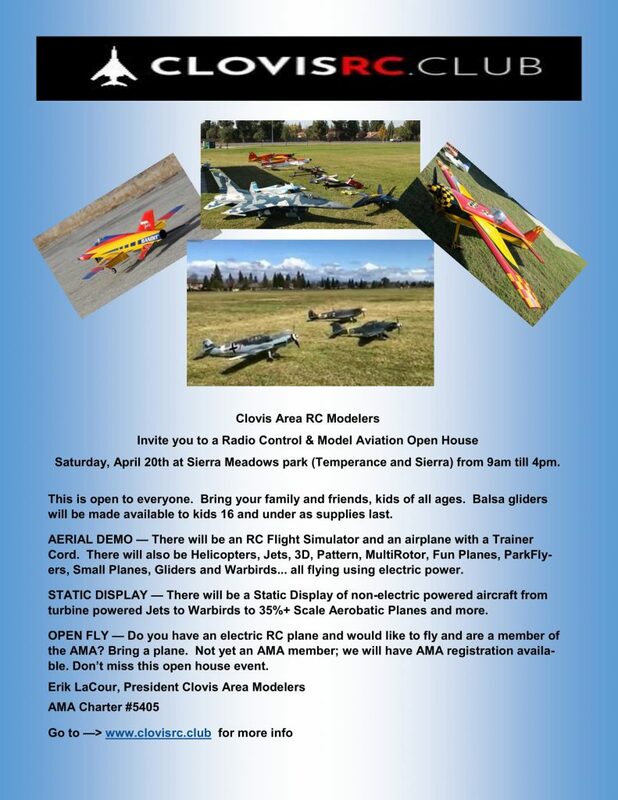 Clovis boys and Clovis West girls received the No. 2 seeds. The finals are set for Saturday, November 21 at the higher seeds home pool. 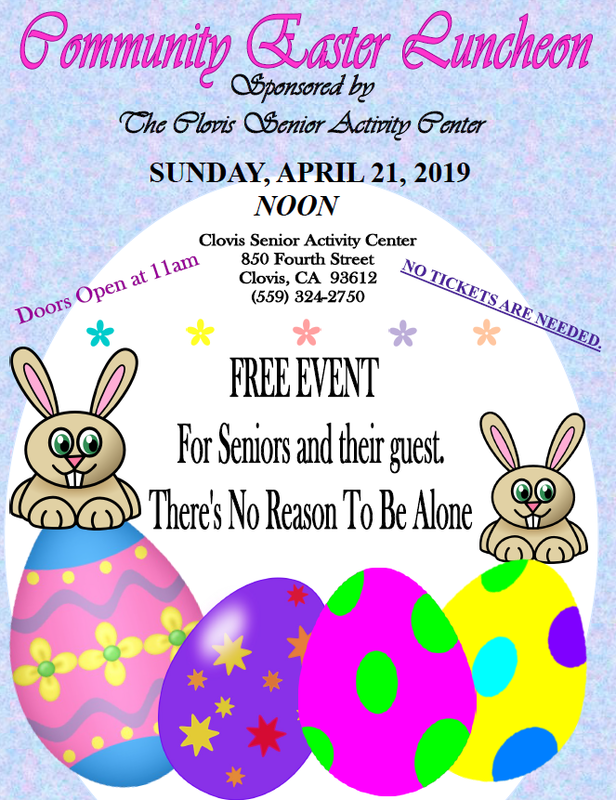 Clovis High won’t have the chance to defend their D-1 Valley title as they lost in the opening round of the playoffs to TRAC foe Clovis North 25-18, 13-25, 19-25, 25-19, 16-14 in a tough five game match. Clovis North then traveled to No. 1 Liberty-Bakersfield where they lost in straight sets. Buchanan also had a first-round game defeating Bullard in straight sets before taking on TRAC champion Clovis East on November 12 (spoiler alert: Clovis East wins but read all about it in this issue). And finally, No. 5 Clovis West lost a home heart breaker to Frontier in five, ending their season. Clovis East is the TRAC’s only hope as they host a semi-final match against Centennial of Bakersfield at home on November 17 at 6:30. The Timberwolves are led by outside hitter Thaliana Grejeda and setter Christina Tran.